Sri Lanka | Who blundered Vesak Poya day? Colombo, Sri Lanka -- As the world commemorates the thrice-blessed Vaisakya day this full moon Tuesday morn, how did Lanka get the date wrong? This week on Friday, the United Nation’s Organisation started a week of Vesak celebrations to commemorate the Birth, the Enlightenment and the Passing Away of Gautama the Buddha which falls this month of May on the 29th — full moon day. And chose ninety percent Buddhist Thailand to be the host nation which, along with other Buddhist countries of the region, will be celebrating the May full moon as the thrice blessed Vaisakya Mangalya. Even in multicultural Singapore, this May 29th is a public holiday on account of Vesak. So why was Sri Lanka, whose proudest boast is that it’s the Theravada Buddhist capital of the world earned by being the cradle of Theravada Buddhism; and its people the true guardians of the pristine message of the Buddha, not in the frame? Not commemorating the Buddha Purnima with the rest of its Buddhist neighbours come this Tuesday? The question must be asked: Did the Government jump the gun? And make millions of its Buddhist citizens observe the hallowed day one month before on April 29th? No real problem with that, of course. Like everyday should be Christmas for Christians, every day should be Vesak for Buddhists. But, in reality, it’s different, is it not? The midnight Christmas mass, the stuffed turkey, the mistletoe and the lit Christmas tree have a special significance for Christians as they celebrate the official birthday of Christ even as the thrice blessed day of Vesak have for Buddhists as they observe sil during day and jaunt to see pandals and dine at free dansals at night. Both are special days. Commemorating Vesak in April is like celebrating Christmas on November 25th. So why did the Lankan Government make Vesak dawn in April and mislead millions of its citizens to believe it so? Who bungled? Who will step forward to take the rap? The decision on which full moon day to celebrate which Poya is decided by a “Poya committee” of the Ministry of Home Affairs. And somewhere last year they decided that Sri Lanka should celebrate Vesak, the single most important Poya in the Buddhist calendar, on April 29th this year. But on what astronomical basis did they do so? What is the rational, traditional, astrological and astronomical basis on which they can justify choosing April 29th as Vesak and not the May moon that will shine in full glory this 29th? Or was it on the toss of the coin that made them hold April 29th as Vesak and call May 29th as Adhi Poson, and call May’s only moon a Blue Moon? Blue moons — the word given to full moons that occur twice in the same month — happen, it is said, every twenty years or so in the months of April and May. To decide which Poya is to be held as the most sacred Poya of Vesak, one has to delve in to the realms of astronomy, the science; and find answer in astrology, the art. Can this Poya Panel at the Home Affairs Minister’s office give answer to the following questions as to why they bundled Lanka’s Buddhists onto an early bus on April 29th and thus made them miss the Vesak float this May 29th? 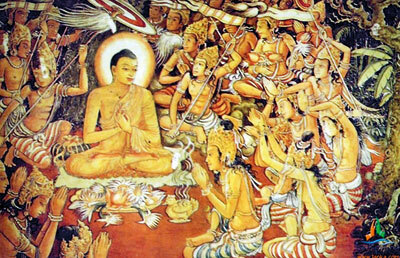 Is it correct that Prince Siddhartha was born on a Vesak full Moon Day under the auspicious nakatha of Visa as it is called in Sinhala or Vaisakya as it is called in Pali? Is it correct that he attained enlightenment on a Vesak full moon day also under the visa nakatha? Is it also correct that he passed away on a Vesak full moon day under the same nakatha of visa? Is it also not true that every Vaisakya moon or Vesak moon dawns under the visa or Vaisakya nakatha and that is the main reason why it is call the Vesak or Vaisakya moon? Has that not been the gauge for centuries to identify which blue moon is the one entitled to be held as Vesak on the basis that the moon has dawned under the visa nakatha? If the above is true, then is it also not true that the April 29th moon this year which was declared as the Vesak moon, dawned under the Sitha nakatha which is governed by Mars the warrior God whereas the Visa nakatha is governed by Jupiter, the benevolent guru in the zodiac? Is it also not correct that the moon this May 29th will dawn under the visa or Vaisakya nakatha? If the Poya Panel’s popes hold the above true, they better come up with a solid reason as to why departed with tradition and led the Buddhists masses astray to commemorate the birth, enlightenment and the passing away of Gautama the Buddha on a full moon day in April that was not Vesak in the month of May. The nation’s Buddhists await answer.